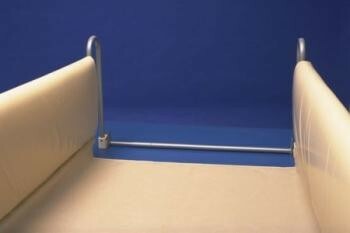 To prevent the patient from pushing their limbs between the cot sides and the mattress, this unit has two bumpers that are sewn together with a connecting loop. Connected Cot Side Bumpers...To prevent the patient from pushing their limbs between the cot sides and the mattress, this unit has two bumpers that are sewn together with a connecting loop. Covered in a wipe clean vinyl, the bumpers are well padded for protection against knocks and bumps. Once in position, the mattress secures the system.